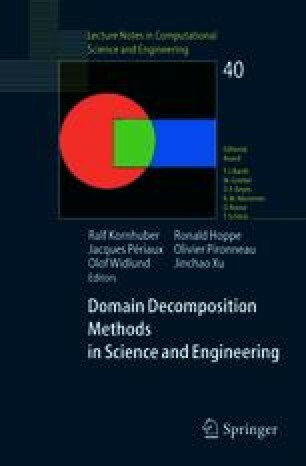 The paper presents a conceptual model and details of an implementation for parallel adaptive finite element systems, particularly their computational kernels. The whole methodology is based on domain decomposition while message passing is used as a model of programming. The proposed finite element architecture consist of independent modules, most of them taken from sequential codes. The sequential modules are only slightly modified for parallel execution and three new modules, explicitly aimed at handling parallelism, are added. The most important new module is the domain decomposition manager that performs most tasks related to parallel execution. An example implementation that utilizes 3D prismatic meshes and discontinuous Galerkin approximation is presented. Two numerical examples, the first in which Laplace's equation is approximated using GMRES with multi-grid preconditioning and the second where dynamic adaptivity with load balancing is utilized for simulating linear convection, illustrate capabilities of the approach.